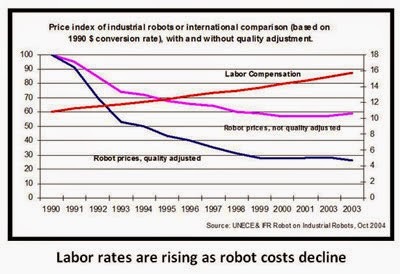 The rise of the robots is happening. The robotic age will reshape human development at least as much as the computer age that we are in now and the industrial age that preceded us. I searched the topic of “robots replacing humans” on Google and I found a diverse set of experts saying that we are just two or three decades away from totally transforming the job market of the world with anywhere from half conservatively to nearly all of human jobs replaced by robots. I have compiled below some insights from these sources including links. Telemarketers – Search “robot telemarker” on YouTube for a demonstration. Reporters – “AP now plans to generate and sell thousands of automated business articles a year. The robot-written stories will bring up the AP's story count in this area by an order of magnitude, Poynter reports. Over the past few years, several news organizations have used robot writers for some of their stories. Forbes uses algorithms from the startup Narrative Science to find and write short stories about companies whose stocks are doing well. The Los Angeles Times uses bots, developed by one of its own journalists, to publish immediate reports about area earthquakes and homicides. The AP will use business reports generated by a company called Automated Insights, Poynter reports. Lawyers and paralegals – “Blackstone Discovery of Palo Alto, CA provided software that helped analyze 1.5 million documents for less than $100,000. “People get bored, people get headaches. Computers don’t. 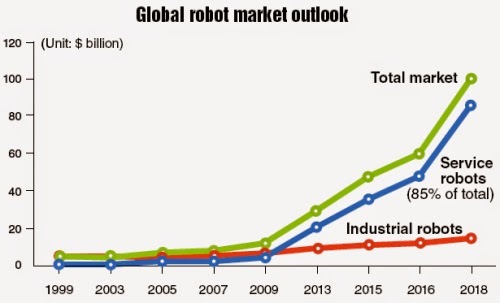 Industrial robots are defined as automatically controlled, reprogrammable, multipurpose manipulator programmable in three or more axes, which may be either fixed or mobile for use in industrial automation applications. 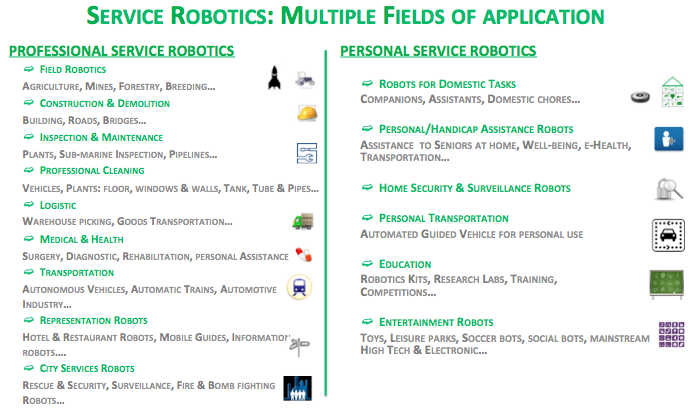 Service robotics are all other robots and robotic applications and systems than industrial robots. Most remaining factory jobs are "likely to diminish over the next decades," they write. 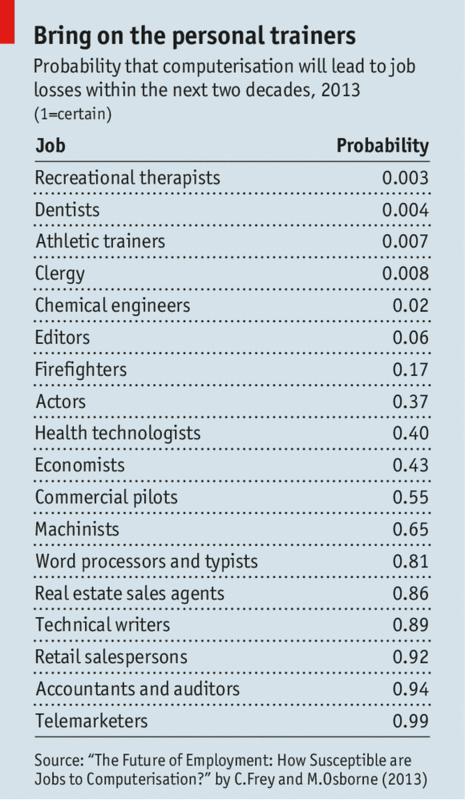 Cashiers, counter clerks, and telemarketers are similarly endangered. 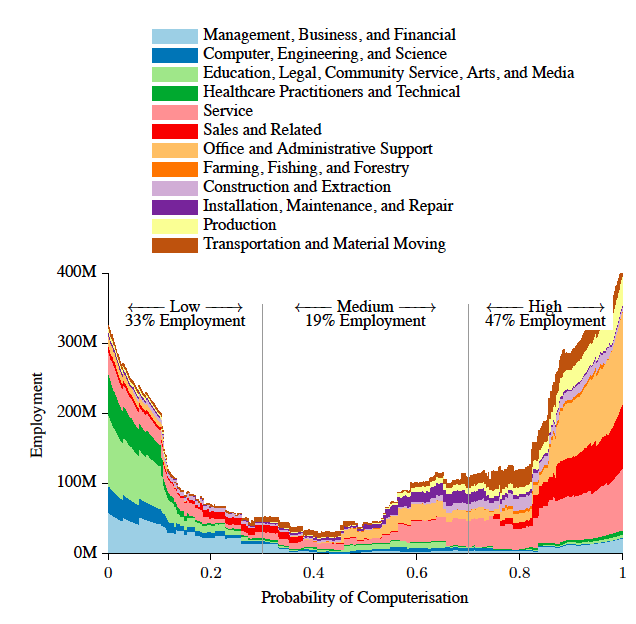 On the far right side of this graph, you can see the industry breakdown of the 47 percent of jobs they consider at "high risk." 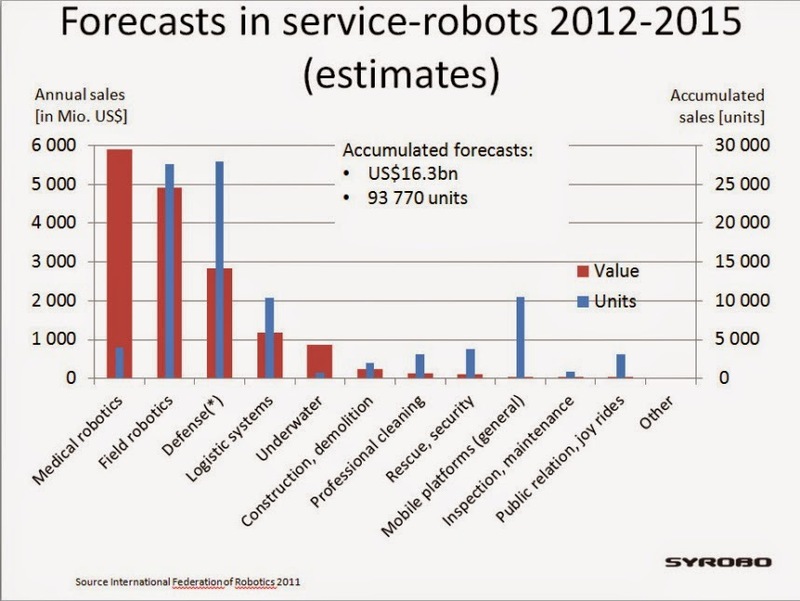 To the typical naive citizen, all this talk about robots taking over menial labor jobs sounds futuristic and exciting. "We can all sit back and relax!" they'll say. "The robots will do all the work for us!" Except for just one thing: the only real reason laborer populations are tolerated by the rich and powerful who really control the world is because laborers are needed to run the economy. Someone needs to pick the crops, sweep the floors and do the dry cleaning, in other words. Once capable humanoid robots transition into all the jobs currently carried out by flesh-and-blood humans, there will be no further need for a large segment of the human population. Roy Jenkins, a once prominent British union leader once said, "Someone invented work and it's time we abolished it." 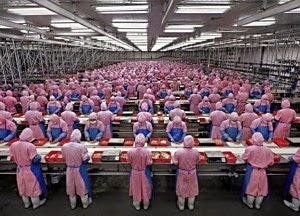 I believe that one day the work will be done by people who want to work, doing only the interesting tasks while robots turn out the goods we need. The news is so biased against certain parts of the world and certain nationalities. When it comes to Chernobyl, the whole world was in a state of alarm. But now with Fukushima things are obviously much worse and the threats are global but nobody cares because the Japanese are on "our side". Is that what we are going to tell the next 10,000 species that die-off specifically because of this event? This is sizing up to be the biggest threat the modern world has seen and where is the lame stream news? Nowhere to be found. If alternative news doesn't replace lame stream, we will be truly lame as a species as far as fixing problems or stopping mad science from running amok. Just prior to the Supermoon of March 18th, 2011, the world witnessed a natural and manmade disaster of epic proportions. What transpired off the coast of Honshu Island, Japan on March 11 has forever altered the planet and irremediably affected the global environment. Whereas the earthquake and tsunami proved to be truly apocalyptic events for the people of Japan, the ongoing nuclear disaster at Fukushima is proving to be cataclysmic for the entire world. More importantly, “Who ought to be responsible for mitigating this ongoing planetary nuclear disaster?” And, is there any practical way this predicament can be fixed? Is there technology available which can address this situation in any meaningful way? Can the USA, the UK, Israel and France completely let go of their control of the Japanese economy, energy infrastructure and political process? Not only does the very existence of Japan rely on this relinquishment of control, the futures of the USA, UK and France do as well. We’re thinking of a Manhattan Project type of gravity. After all, if such a serious project was established in the interest of creating an atomic bomb, surely a similar endeavor can be initiated in the interest of saving the same country, that was ravaged by nuclear war, from Fukushima-generated radiation. Japan has clearly shown that this disaster is way beyond their ability to manage and capacity to address in any meaningful way. Their entire culture seems to ensure that the real problems will be constantly swept under the rug. The problem this time around is that there may be no rug soon to sweep it under. The upshot of each of these articles is that the Pacific Ocean is extremely vulnerable to the radioactive waste being dumped into her waters at Fukushima. Should another catastrophic earthquake occur, it could create a new and more complicated nuclear disaster scenario that is truly irreparable. Even without any seismic activity affecting the nuclear sites, the current state of affairs has taken for granted that the Pacific Ocean will become a nuclear dumping ground for decades to come. It has not been lost on us that such an inevitability appears to be the only practical expedient available. Never in the history of humankind has the planet been confronted with such a grave set of circumstances. Fukushima represents all that can go wrong when scientific applications and technological advancement within a crude industrial context have gone awry. Unfortunately, given the many trajectories that numerous fields of technological innovation are currently on, Fukushima and the BP Gulf oil spill of 2012 may only be the beginning of an accelerating period of technospheric breakdown which will plague the Earth. There has been no mention in this essay of the massive amount of debris pollution brought about by the Japan earthquake and tsunami of March, 2011. We have chosen a photo-documentary instead to portray this state of affairs in the following addendum. This debris is found in the "The Great Pacific Garbage Patch"
The following article gives a much broader view of the current predicament which prevails across the planet. Clearly, technospheric breakdown is a phenomenon which few foresaw, otherwise we would not find ourselves at the edge of the precipice with respect to so many risky and dangerous technologies and misapplications of scientific developments.